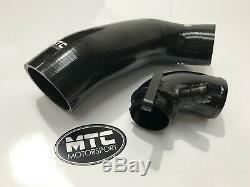 MTC Motorsport Golf R intake turbo elbow (black) and hose combo. This will fit the following models perfectly. Golf MK7 GTI and Clubsport/Clubsport S. Golf R MK7 and MK7.5. Audi S3 8V 2.0TFSI. Audi A3 8V 2.0TFSI. Audi A3 1.8TFSI 8V 2012+. Audi TT/TTS 1.8TSI 2.0TSI 2014+. Seat Leon Cupra 1.8TSI 2.0TSI 2012+. Skoda Octavia VRS 5E 2013+. Skoda Octavia 2.0TSI 2013+. Skoda Octavia 1.8TSI 2013+. MQB engines only with this elbow. This bolts directly onto the turbo and where the standard plastic pipe is restrictive this is much bigger and will flow a lot more air into the turbocharger. The connection into the turbo is CNC machined from aluminium and is a great fit. Massive improvement to the response and torque with just installing this elbow, we have also seen some surprising power gains with just this installed. Great bit of kit for very little compared to other brands and takes 2 minutes to fit. Will come with new O rings on the elbow. Check out some of our other items including intercooler kit for these models. 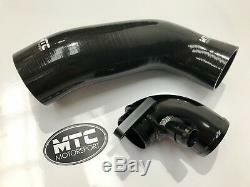 The item "MTC MOTORSPORT INTAKE INLET TURBO ELBOW PIPE SEAT LEON SKODA OCTAVIA 2.0TSI HOSE" is in sale since Saturday, July 28, 2018. This item is in the category "Vehicle Parts & Accessories\Car Tuning & Styling\Air Intake & Induction\Turbochargers". The seller is "mtcmotorsport" and is located in Clitheroe.